The guy was clearly a dolt, or trying to provoke me, or both. His bizarre question, however, tidily illustrates a key assumption of the anti-choice movement: that people who are pro-choice are anti-baby. But just because someone believes that people should have the right to end their pregnancies doesn’t mean they’re obliged to get an abortion if they themselves become pregnant. And falling in love with my son—and by extension, babies in general—only further cemented my conviction that abortion should be available on demand, for any reason. When I started to think that maybe I might want a baby, and that this might be my only chance—past health issues had indicated infertility—I agonized over the moral and practical implications of continuing my pregnancy. I made an appointment to get an abortion. Then I canceled the appointment. I talked to my friends, my parents, my co-workers, and the embryo’s father. I cried a lot. In the end, despite the inauspicious timing and my prior conviction that I would never parent biological children, I decided to accept the curveball the universe had thrown me and become a mother. Each day that I spend caring for my child rather than pursuing my pre-baby interests and dreams, wistful “what-ifs” and nascent resentments quickly evaporate when I remember that I freely chose this path. I am a better parent because I chose to become a parent. What’s more, I feel that it was a good choice: I have a loving family, loyal friends, and a supportive co-parent in my baby’s father. I have enough money to care for my child, stable housing, and, thanks to Medicaid, health care for my son and me. If my circumstances hadn’t been so favorable, I might have chosen differently. And had carrying a baby to term been anything other than a carefully considered act of personal agency, I suspect that the suffering would outweigh the joy. 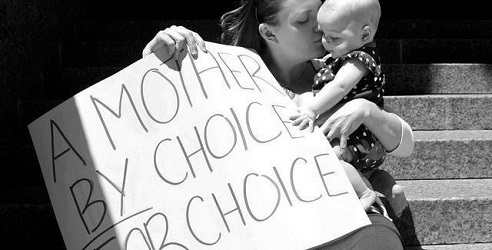 The understanding that no one should have to undergo the pain, the loss of bodily autonomy, and the extreme change in circumstances inherent in pregnancy, birth, and parenthood against their will has always been at the basis of my pro-choice convictions. But having a baby—experiencing a love of previously unimaginable intensity—added another, very personal, dimension to my beliefs. Never having been a “baby person,” I considered myself immune to the charms of what I saw as drooling, squawking poop machines, and was concerned that I wouldn’t feel a connection with mine. I needn’t have worried: when I held my son to my breast, his perfection, and my love for him, struck me with brain-scrambling force. Inextricable from this epiphany was a tremendous heaviness, a sickening awareness of his vulnerability. I saw how easy it would be to harm him, how desperately dependent he was. I recalled every baby-related horror story I’d ever heard, and my fierce drive to protect and nurture my own baby was matched by grief for all of the equally valuable little ones who aren’t so lucky. And I knew—knew—that for a baby to come into the world unwanted and uncared-for is a grievous wrong. The preciousness of babies is a constant refrain in anti-abortion rhetoric—but the focus is almost entirely on making sure they’re born. When holding forth on the value of human life, anti-choice activists largely ignore domestic violence and child abuse, and access to healthcare and education. Most importantly, the staggering inequality that consigns many young people to lives drastically lacking in opportunity. The politicians who pander to this demographic by opposing safe, legal abortion are busy cutting the programs and services that help to ensure that all babies can thrive. For the anti-abortion movement, the quality of the life they purport to hold sacred is a non-issue. The idea that life must be preserved as a good in and of itself, no matter what the cost—that even the greatest life suffering imaginable is preferable to death—is similarly offensive. A fetus is not a baby. And for a completely innocent being that lacks self-awareness—whose only reality is immediate sensation, and who absolutely requires constant, gentle attention—neglect and abuse is much worse than non-existence. Emily Klein is a writer and artist who holds a B.A. in cultural anthropology, a distinction that has qualified her to work in many fine restaurants and live with her parents. When not nursing her son or managing his waste, she spends her time cooking, thinking about the intersection of culture and the body, and giving herself ridiculous haircuts.